'In Rust We Trust' Stars and Stripes USA Style Document Holder Bag. A4. Briggs South Amboy New Jersey Old Style Round Sticker. 4" or 8". Brut Aftershave Green & Gold Sponsors Stickers. 4" Pair. 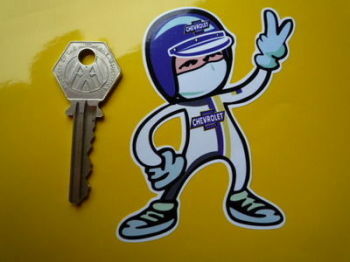 Chequered Flag Stickers. Corvette Style. Black & Clear. 4" Pair. Chevrolet & Oldsmobile Dealer Sticker. 4". Chevrolet 'Genuine Parts' Bow Tie Stickers. 2" Pair. Chevrolet 'Genuine Parts' Sticker. 12". 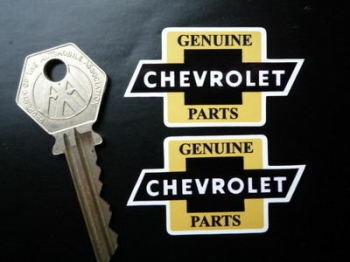 Chevrolet 'Genuine Parts' Sticker. 3.25", 6", or 8". Chevrolet 'Powered By' Wheel Style Sticker. 3.5". Chevrolet Advance-Design Trucks Sticker. 4". 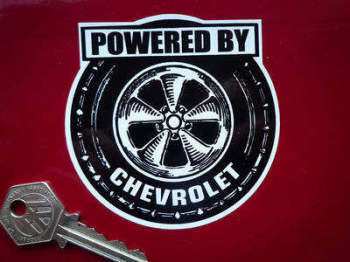 Chevrolet Black & Red Cut Vinyl Sticker. 9.5". Chevrolet Blue & Yellow Classic BowTie Sticker. 11.5". Chevrolet Blue & Yellow Classic BowTie Stickers. 4" or 6" Pair. Chevrolet Corvette Fade To Black Oval Sticker. 3", 4", 6" or 8". Chevrolet Corvette Old Style Classic Circular Sticker. 6.5". Chevrolet Degler Pennsylvania Dealer Self Adhesive Car Badge. 3". Chevrolet Dicky Bow Black & White Sticker. 8". Chevrolet Dicky Bow Black & Yellow Wheel Centre Stickers. Set of 4. 50mm. Chevrolet Dicky Bow Laser Cut Self Adhesive Car Badge. 4". Chevrolet Dicky Bow Rusty Style Sticker. 5". Chevrolet Dicky Bow Style Laser Cut Magnet. 3.75"
Chevrolet Driver 2 Fingered Salute Sticker. 3.5". 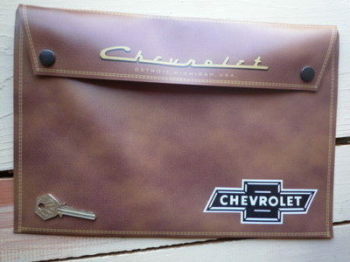 Chevrolet Flag & Scroll Style Sticker. 4" or 11". Chevrolet Flames Stickers. 5.5" Pair. Chevrolet Hot Rod Oval Style Stickers. 4.75" Pair. Chevrolet Logo Circular Laser Cut Self Adhesive Car Badge. 25mm. Chevrolet Naked Girl Pin Up Lady Sticker. 5". Chevrolet Old 'Grill' Style Stickers. 4" Pair. Chevrolet Parking Only. London Street Sign Style Sticker. 3", 6" or 12". Chevrolet Royal Flush Playing Cards Style Sticker. 4". 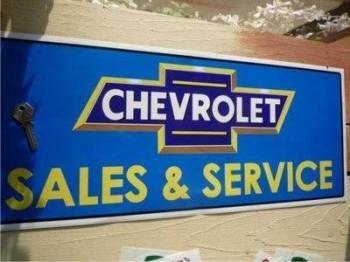 Chevrolet Sales & Service Sticker. 23.5". Chevrolet Shaped Torpedo Stickers. 6" Pair. Chevrolet Stars & Stripes Fade To Black Oval Sticker. 3", 4", 6" or 8".